BIRD OF THE MONTH: Eclectus Parrots + More! Happy Holidays everyone! I had planned to create another species for December's Bird of the Month, but Rush orders took my time! So instead I am offering you a Male and a Female Eclectus, since I had these on hand, and they are such perfect Christmas birds with their gorgeous red and green! In addition, I created a special pair of earrings made with feathers from my own Eclectus parrots! All of the pieces are on auction, ending on Wednesday, December 11th. In addition, I HAD to make a few more "bird poop" pieces since you keep asking for more, to my great amusement! There is a magnet, necklace and a pair of earrings, all on auction on eBay. 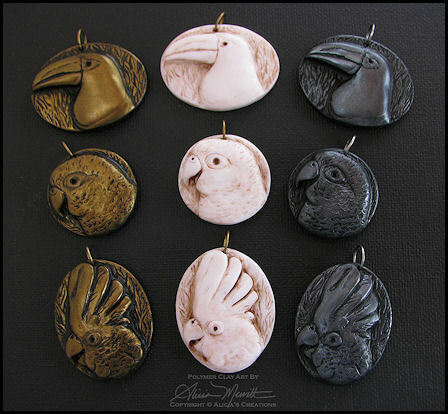 To see all of the pieces on sale, visit my eBay auction listings here: http://www.ebay.com/sch/parrotjewelry/m.html?_ipg=50&_from&_nkw&_armrs=1&_sop=10"
There is also a Faux Ivory Goffin's Cockatoo necklace, as well a variety of "Infinite Love" themed jewelry including a pair of earrings, bracelet, and necklace. All of the pieces are on auction on eBay and end on Wednesday, December 11: http://www.ebay.com/sch/parrotjewelry/m.html?_ipg=50&_from&_nkw&_armrs=1&_sop=10"
This Bird of the Month is a bird that I've never sculpted before, and have been wanting to tackle for some time. After continuing to receive requests, I decided to go ahead and pick this bird for November, and it is the Green Aracari! They are Toucanets (like "mini toucans"), and I found that the males in this species have a black head and the females have a brown head. 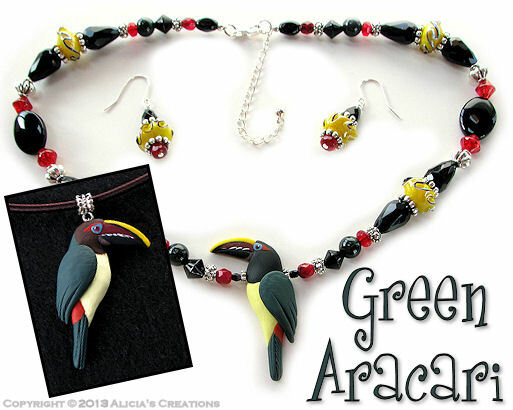 I created a male Green Aracari beaded necklace set, and a female Green Aracari on a cord necklace, and both are on auction now, ending on Friday, November 22nd. Be sure to take a look at my ARTdornments jewelry too as there is a piece featuring a pair of Green Aracaris as well. To see all of the pieces on sale, visit my eBay auction listings here: http://www.ebay.com/sch/parrotjewelry/m.html?_ipg=50&_from&_nkw&_armrs=1&_sop=10"
BIRD OF THE MONTH: Senegals + More! After several months without a Bird of the Month collection, I'm thrilled to be back with some new creations for you this month! 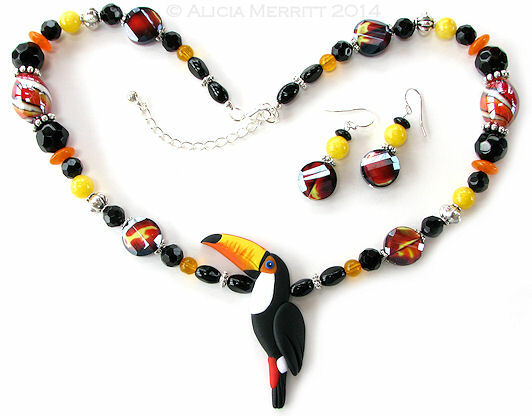 I've chosen the Senegal parrot for October, and there are three necklaces on auction on eBay, ending on Friday. 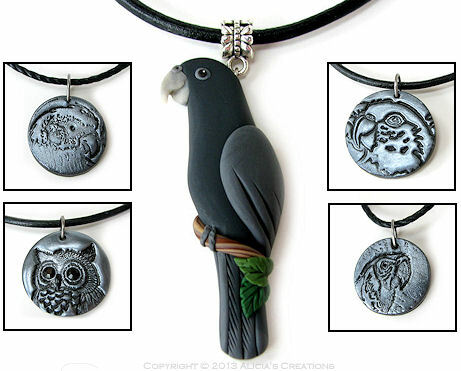 In addition, there are an assortment of other new pieces on auction this week, including an abstract silver swirl pendant, a Serendipity ("scrap clay") parrot, two Congo African Grey necklaces (one Fall themed), and another owl pendant. To see all of the pieces on sale this week, visit my eBay auction listings here: http://www.ebay.com/sch/parrotjewelry/m.html?_ipg=50&_from&_nkw&_armrs=1&_sop=10"